Christ's has excellent music technology facilities – a state-of-the-art purpose-built studio with a suite of Apple Mac computers running Logic Pro X and Sibelius software (opened in 2015), as well as a good selection of high quality microphones for various purposes and other audio equipment. Music Technology has been fully integrated into the Lower School curriculum. It is a major feature of GCSE work and there is also a Music Technology after school club. Students often use the equipment during lunch break and after school, learning to record their own music, as well as using the technology as a tool for composition. 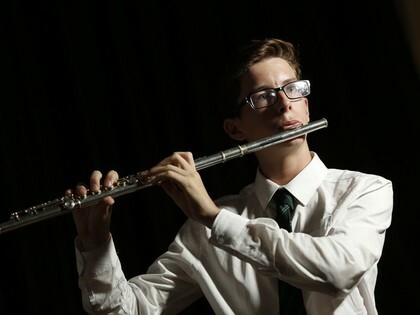 Through taking responsibility for sound, lighting and stage management for musical and other events at school, pupils can, under the guidance of the Director of Music, develop invaluable skills in the technical side of productions. Most years, the entire Year 7 cohort gets together to perform a cantata. Past projects have included Captain Noah and his Floating Zoo, Rinning on Rails and The Daniel Jazz; last year the pupils performed Jonah Man Jazz in our autumn concert. The Lower School music curriculum is constantly under review, and has been recently adapted to make full use of the technology suite without abandoning live performance which we believe should be at the core of every music department. Every project is designed to focus on all three of the music "attainment targets" - performing, composing and listening/appraising. Students can opt to take GCSE Music in Years 10 and 11. They have 150 minutes of music lessons per week and follow the Edexcel syllabus. Students have an individualized programme of study and can follow many of their own creative and performance projects, besides studying a core of set works, covering all genres of music. Performance by Christ's pupils as part of at least two PTA-organized events every year. Christ’s Jazz Band mini-tour: an annual event featuring the jazz band, which also performs in major events in school throughout the year. A choral and orchestral concert, featuring Karl Jenkins’ Adiemus, Songs of Sanctuary, and solo performances with orchestra by two of our most advanced instrumentalists. This resulted in an invitation to perform at the Carnegie Hall in New York in the presence of the composer. In 2017 our choral and orchestral concert featured Fauré’s Requiem and concerto performances (accompanied by a largely professional orchestra) by students playing violin, viola and flute. Christ's annual Carol Service at Holy Trinity Church; this is a major musical event featuring a minimum of three choirs, orchestra and other ensembles. A series of around five "At Homes" every year: informal small-scale concerts designed for the playing and singing of solos and small ensembles in the more intimate environment of Christ's Music Centre.